Laser (Light Amplification by Stimulated Emission of Radiation) found its application in various industries and medicine. For years he is because of the use of the generated light quality. In our practice we use NdYag and erbium YAG laser. when NdYag laser is a laser type used as a radiation source matrix yttrium aluminum garnet. He does so by emitting a strong high-energy wavelength of light which, when it is focused on a particular skin part, generates heat and thus destroys the diseased cells. Where does the laser NdYag its use? The NdYag laser is used in various skin changes because it was designed to treat a variety of skin problems. Most often it comes in the following areas: in vascular lesions of the NdYag laser for the removal of capillaries in the face (cheeks, nose and forehead) and in the legs is used successfully for removal of age spots, dilated blood vessels in the legs, veins on the face, vascular tumors on the face and around the mouth around. In the pigment changes NdYag laser to remove brown age spots, freckles, blotches on the back, Mongolian points, spots on the face, stains can be used with a blend color. The melanin is targeted at variable depths in or on the skin by laser pulses. Depilation, NdYag laser successfully removes hair on any skin surface: underarms, bikini line, face, neck, back, chest and legs. Bensonders effective for treatment of dark hair in people with, according to Fitzpatrick, skin types I-III. The laser pulses are focused on the hair follicle, thereby not only obtains that the hair falls out and decreases, but thus their growth is slowed. Tattoo removal of NdYag laser removes tattoos of blue, gray and black. The color and depth of the pigment of the tattoo influence the duration and the result of the laser treatment. Under laser treatment is understood to mean the selective destruction of ink molecules, and thus a successful elimination thereof. Under onychomycosis refers to the infection of the nails by pathogenic fungi. It is fairly common. Treatment with NdYag laser is more efficient than currently existing solutions and antifungals, but without long-term treatment and especially without the risk of side effects, effects which may occur frequently in pharmaceuticals. The laser light is directed over the entire nail, including the envy nails. Whereby the nail heated (heated) and the existing fungi successfully destroyed. In order to ensure a complete cover, a whole series of pulses is repeated 4 times and overlaps the individual light beams. Erbium YAG laser When Erbium YAG laser is a laser type which uses doped yttrium aluminum garnet as the radiation source matrix with erbium. Unlike NdYag laser, the erbium YAG laser light is strongly absorbed by water molecules. When the Erbium Yag laser is applied? Damaged skin lesions most commonly the Erbium Yag laser for scars on the skin (caused Duch acne and varicella), dyschromias (melasma, age spots) Facial wrinkles and solar keratoses used. Dentistry the Erbium YAG laser is also used in oral surgery, dentistry, dental implants and in the otolaryngology. 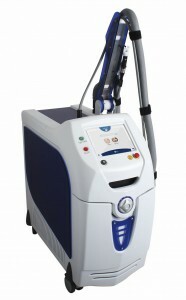 The output of the Erbium YAG laser is absorbed by water and thus it is best suited for cutting bone and soft tissue. Wart removal, the use of the Erbium YAG laser in the treatment of warts and premalignant keratosis is increasingly used in medicine. The Erbium YAG laser allows for precise ablation (removal of body tissue) in which inflammation is avoided. The process is completely safe and effective. Our laser show with good clinical results, a much shorter recovery time and much less side effects compared to conventional laser use. Currently, they are mainly just in aesthetic surgery, uses and are applied safest. We offer you quality that brings lasting results.